Daniel W. Harris began his police career in 1972 as a police officer with the Phoenix, Arizona Police Dept. In 1975 he served for one year as the Chief of Police of Parowan, Utah. In 1976 he became a Deputy Sheriff with Iron County, Utah. He left law enforcement for two years prior to joining the Utah Highway Patrol in March 1979. During the next three and a half years, Trooper Harris served in Field Operations, Internal Affairs, Executive Protection and on the Motorcycle Squad. 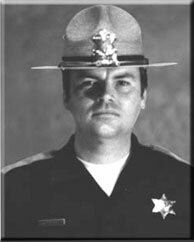 On August 25, 1982, Trooper Harris was in pursuit of a speeding vehicle, westbound on I-80 in Parleys Canyon. Trooper Harris failed to negotiate a turn and his 1981 Kawasaki motorcycle left the roadway and struck an embankment. Trooper Harris died due to massive head injuries. He was 33 years old and was survived by his wife, Andrea, two daughters and two sons.